The Federal Housing Finance Agency (FHFA) needs to control employee compensation more directly at Fannie Mae and Freddie Mac in order to contain costs at the two housing finance institutions, according to a report by FHFA’s inspector general. "FHFA-OIG believes that FHFA has a responsibility to enhance its current non-executive compensation oversight through reviews or examinations," the report said. The report, released Monday, describes the compensation levels at different employment ranks within Fannie Mae and Freddie Mac. It then provides recommendations for how FHFA should strengthen its control over employee pay. Fannie and Freddie are government-sponsored enterprises that the government has controlled in a "conservatorship" since 2008. The FHFA is charged "to preserve and conserve" the two enterprises, according to its website. "There has been considerable Congressional interest in, and public debate about, the compensation paid by the Enterprises," the report said. The report builds on one issued last year on executive pay and "examines pay practices affecting the Enterprises’ approximately 2,100 highest paid employees," including executives, senior vice presidents, and senior professionals. The report finds that the "FHFA has not reviewed, examined, or tested the enterprises’ compensation programs to ensure that they are effective in mitigating costs." FHFA took steps to curb top executive pay last year after the first report, cutting Fannie and Freddie’s CEOs’ pay from $5 million to about $600,000 each this year, the report said. Further cuts could be on the way. The report includes a statement from the FHFA in which it agrees substantially with the recommendations, although it criticizes some of the methods that the inspector general uses for calculating compensation. For the report, the inspector general conducted a limited study of how the compensation for new hires at Fannie and Freddie compares with the "median market compensation level." The study found that one enterprise "offered 8 of its 10 hires (80 percent) base salaries that exceeded the established median level," with a quarter of these exceeding the median by 20 percent or more. 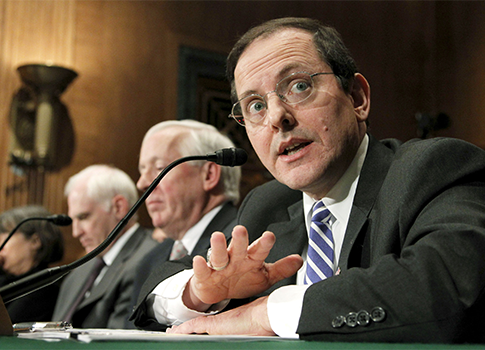 "The results of the limited test suggest the need for FHFA to consider assessing the effectiveness of the Enterprises’ controls over the offers of compensation they make to newly-employed senior professionals," the report said. The report did not specify if it was Freddie or Fannie that made the excessively large offers; the other offered compensations close to the market median. Alex Pollock, a former president and CEO of the Federal Home Loan Bank of Chicago and now a housing finance expert at the American Enterprise Institute, called the report "extremely useful, because it highlights the fundamental decision" that the government will have to make about Fannie Mae and Freddie Mac. "What this report highlights is the inherent contradictions in being a government-sponsored enterprise," he said. He called the notion of a government-sponsored enterprise as an "inherently self-contradictory idea," noting that the government tried to allow the businesses to run as private businesses while providing them advantageous guarantees not available to truly private companies. The FHFA indicated that it still views Fannie and Freddie as private entities: "FHFA views part of its ‘preserve and conserve’ mandate to include preserving the entities as private companies with the capacity and responsibility to make business decisions following normal corporate governance procedures." House Committee on Oversight and Government Reform Chairman Darrell Issa (R., Calif.) released a statement praising the report. "The report issued today by the FHFA Inspector General indicates clear progress after the Committee’s calls last year for reform of lavish executive compensation packages at taxpayer-funded Fannie Mae and Freddie Mac," he said in the statement. "Although today’s news shows some meaningful improvements in executive compensation at this taxpayer funded entity, it is clear additional work remains." Pollock argued that being part of the government comes with certain restrictions. "How can you justify these salaries," he said. "The answer is, if you’re part of the government, you can’t." Fannie Mae and Freddie Mac did not return a request for comment. This entry was posted in Politics and tagged Congress, Darrell Issa, Fannie Mae, Federal Bureaucracy, Freddie Mac, Obama Administration, Obama Economy. Bookmark the permalink.